NOTE: This article was written when the site was vacant, before construction of a large new house was begun in 2007. Perhaps you have traveled past the corner of 8th Avenue and 20th Street and noticed the incongruity of the large open lot on the northwest corner. After all, this area in the heart of the Broadway Historic District is filled with large homes which are placed fairly tightly together, with most yards that tend to be 30 to 50 feet wide. If you traveled past this lot before 1988, can you remember what you would have seen? This postcard shows this corner in 1908, as the message on the back was postmarked that year. The home at 734 20th Street was built for Frank Mixter in 1899, constructed by contractor John Volk at a cost of $13,000, a very substantial investment at the turn of the century. At the right of the postcard is the home of Phil Mitchell, Frank’s business associate, which still stands today and has been restored. Not seen to the north of the Mitchell House is the Conner-Parker House, commonly known as The Victorian Inn. The Mixter House was actually larger than the Mitchell House and probably similar in massing to the Conner-Parker House. 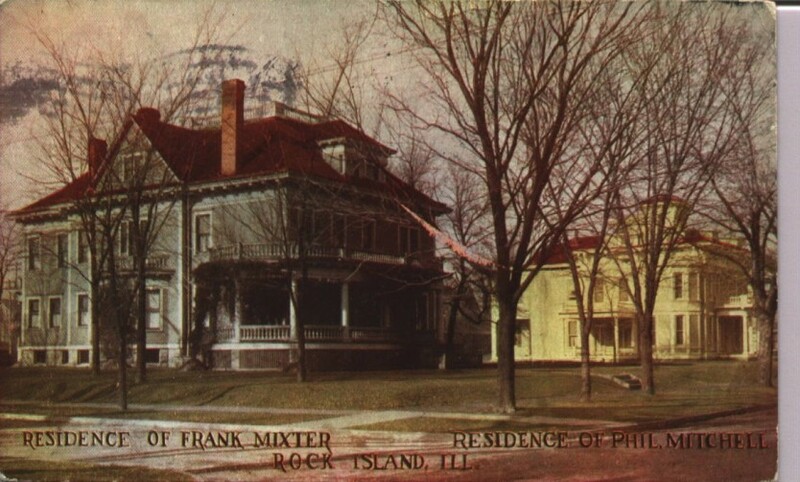 Frank Mixter was one of eight children of George and Susan Mixter, who were early and prominent settlers of Rock Island. George was born and raised in Massachusetts, graduated from Yale and was intrigued by what was then the far, far west. Pleased with the climate and business prospects, he settled in Rock Island in 1837 and, except for two years spent in Dixon, Illinois, he remained in Rock Island for the rest of his life. He married Miss Susan Elizabeth Gilbert of Moline in 1845. By profession, George was a lawyer but put aside professional engagements to manage vast business enterprises. Frank was born in 1853 and received his early education in the Rock Island Schools, then went to the university at Heidelberg, Germany. Frank was associated with the Rock Island Stove Company for half a century, starting in 1877 as a bookkeeper. In partnership with Phil Mitchell he purchased the firm, rising to president and then chairman of the board. Aggressive marketing of the high quality Riverside Stoves allowed the stove company to flourish. In 1871, 205 stoves were sold, but by 1890 they claimed to have sales of 20,000 stoves annually. Described as “a man of poise, foresight, good judgement, and superior business acumen” Frank also had financial interest in many other Rock Island enterprises, including the Rock Island Buggy Company, The Republic Oil Refining Company, and the State Bank of Rock Island. His neighbor, Phil Mitchell, was also usually involved in these firms. The Mixter House was a grand Colonial Revival structure with a stately wraparound porch on the front. It also had a porte cochere – a covered porch for carriages to pull under – on the north and a two- story carriage house to the rear. While the style of the home was fairly simple, no cost was spared on the decorative detailing. A massive arched-top stairway window on the north contained stained glass in shades of gold, a triple window in front was topped with leaded glass transoms, and a decorative balustrade marked a roof gallery, which is just barely visible in the postcard. The balustrade was repeated at the second floor level of the front porch and the south side bay, which had a door with colored glass sidelights opening to the balcony formed by the bay. The front of the house had an exceptionally wide frieze (border between the siding and the eave) and wide vertical boards in the front corners to give a pilaster effect. Mr. and Mrs. Mixter lived in the home until his death in 1934. Elizabeth moved to her daughter’s home shortly after becoming a widow and died at age 85 in 1937. Perhaps she lived the remainder of her life not knowing that her lovely home had fallen prey to a landlord that carved it into 10 apartments in 1936, increasing the density to 15 units by 1945. Over time, much of the decorative detailing was lost. The original wraparound porch was removed, along with most of the balustrade detailing found on other porches. The roof top was altered, due partially to a fire, and the original roof gallery had been enclosed and enlarged to form a room. The property fell into disrepair and was largely neglected as it approached its demise in 1988, when it was torn down. Many would say that these large homes were fated to become apartment houses simply because of their mass and their locations, yet other homes in the area, which were also converted to multifamily, did not experience the extreme abuse and neglect of this ill-fated mansion. The Mitchell House next door suffered similarly under the same landlord but today has been restored. For a time, the work there stopped traffic as gawkers admired the detailed replica of the original porch, which transformed the front facade of the house. This article, by Martha Dismer, is slightly modified from the original that appeared in the Rock Island Argus and Moline Dispatch on October 14, 2001.